It’s bleak here; the sky solid grey, the wind chill and a hint of drizzle in the air. Not the best weather for photos. Not the best weather for examining plants. They are there though, the plants. Buffeted by the wind and tatty and tough. Some are preparing for Spring. 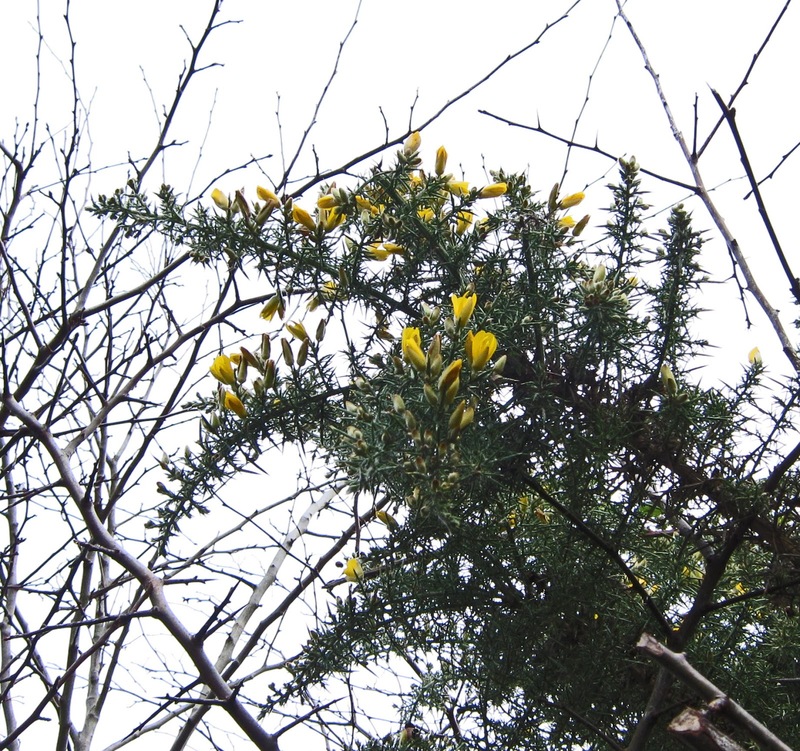 Others, like gorse, never give up on Summer! A quick dash outside and the drama of survival and success is revealed. Brambles swamp whole areas. If they were in gardens, the owners would despair - but here . . . they mean blackberries, come the autumn. Most of them will be inaccessible for humans but enough will be in reach to keep a couple of hundred pickers in pies and jam. It’s surprising how much is there at our feet. My ability to identify wild plants is minimal but I’ll have a bash. A large-leafed Cranesbill (I think) and the beginning of tall plants in the Apiaceae family which includes carrots and parsley and ground elder. By ‘tall’ I mean two or three feet and, in the summer, they will support white umbels. There will be Queen Anne’s Lace and Cow Parsley and horrid solid, plate-like equivalents as well as the Ground Elder which nearly all gardeners rip out before it flowers. There are oak leaves here too, brought from further along the path by the wind. 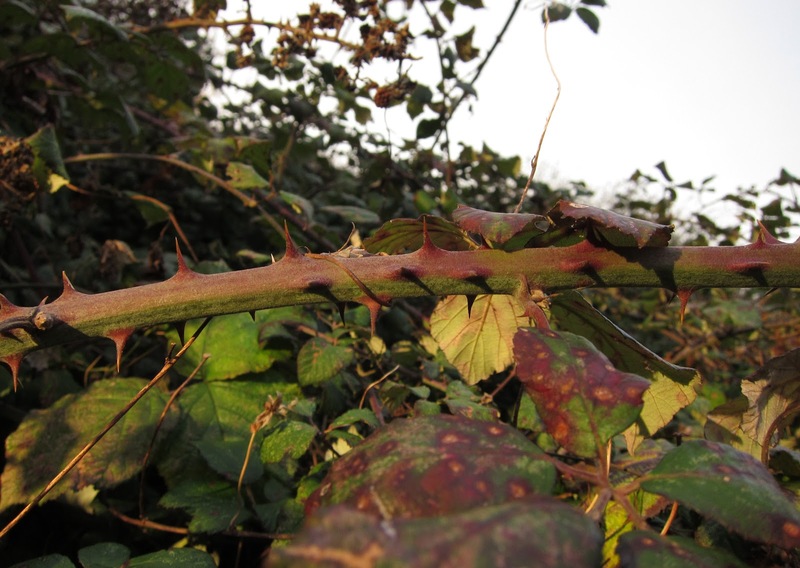 See young Nettles; and Cleavers which will stick sticky burrs to our socks later in the year. Incidentally, although ‘Cleavers’ (Galium aparine) seems to be the widely accepted name, I was brought up calling it ‘Goose Grass’. Honeysuckle. This particular one flowers late and long. I think it is a domestic escapee rather than a truly wild plant but there’s a long stretch of it still in leaf. And grass. Never ignore grass. There are lots of kinds, even by the wayside. This is tough and clumpy. Its flowers and seeds won’t be especially interesting, at least, not to me and not compared with other, more delicate kinds (like wild oats) or the elegant kinds (like wild barley) or a host of others I am unable to name. However, if you imagine taking one clump and putting it in a flower pot and keeping it free from ‘weeds’ - why is this less interesting than a popular garden grass like Carex? If you clear your mind from preconceptions, it’s astonishing how beautiful are the tough and common plants at our feet. My black cat has an unfortunate tendency to walk among Cleavers (known in this house as that weed with the burrs). He does not appreciate having them picked out of his fur. I don't suppose he does - but I imagine his insides might object if he cleaned them off for himself and digested them. Lucy - I haven't visited your blog for ages and it's lovely to be back. Those cleavers are also bursting out of the ground in my garden, even though it was frozen solid until about a week ago. The honeysuckle looks like Lonicera japonica, whose flowers come in pairs along the stem, rather than in terminal clusters like our native one. It's one of my favourites and seems to attract lots of moths, too. Thanks Nigel. So pleased to see your comments here again. I'm afraid it's rather a monochrome post, this one - but I was pleased the drizzle let up long enough to take even these pictures. It's a surprisingly exciting time of year - seeing what's there despite everything the weather has thrown at (or on!) it. Hello Country Mouse. Hope you are over your flu soon. and there I was, innocently encouraging Lucy to blog on ... glad you did tho! Your thoughtful post was a good reminder that I need to look at the ordinary and find the extraordinary. I look forward to visiting your throughout this year for further inspiration. May your gardening year be filled with growth and abundance. The origins of this blog go right back to the adventures of my next door neighbour, Esther Montgomery, which she described in her blog Esther in the Garden. I took up where she stopped and there was an interaction between the two blogs for a while. At that point, there was a shared readership so everyone knew about this connection but as time has gone on, new readers have arrived and the blogs have drifted apart and taken on their own identities. It's fun the way things evolve. Hello Weeping Sore. What a lovely comment! I'm glad you will be visiting through the year. Thanks for showing me that the plants are already starting to grow. It's heartening to see, as it seems as dark as ever in the mornings and evenings. The birds are starting to sing too. Hesitantly, but a good sign. The astonishing thing is that many plants have never stopped growing round here, despite assaults from ice and snow. The goose-grass/cleavers has been specially pretty and non-stop green. When it gets to its trailing around all over the place it becomes less attractive. We need a reminder that mother nature's doing her bit, even in the darkest depths of winter. I've just popped in to get your blog's URL as I'm writing a post featuring our conversation this afternoon re bargains and blueberries. I'm away seeing family then, so won't be around to let you know! Hello VP. I look forward to reading your post. Hope it's the kind of family visit you will enjoy. How lovely to see something... anything... green! It's all snow and brown here in my part of the US right now! We like to leave the dog fennel and native geraniums growing among our manicured plants. Sometimes we even leave some of the plaintains for the wooly bear caterpillars to eat. I enjoy seeing "weed" photos, thanks! hope it works for you, you have lots of great photos! Hi Lucy, I was drawn by your blog name (mine is loose leaf notes) and have enjoyed looking at your photos. great to see some new growth coming. Hope you get some nice sunshine soon. I too am learning to love the grasses. They faithfully return even if they don't produce traditional flowers. Your bright cheery green pictures remind me that there is always something outside to see, even in the depth of winter. Hello Mary. We had snow for a while. I enjoyed it because it is a rare experience where I live. We now have rain. It's gentle rain on the most part and it's warmer than it was so quite a lot of things are green - on the other hand, the ground underfoot is turning to mud. Hello Quasi Serendipita. While the snow was here, I was astonished to see many plants peeping through it, apparently un-concerned - and they continue to thrive. Hello Jamo Pepper. I was thinking of making a slide-show of my own photos rather than using random ones from the web. I now understand I have to create a Picassa or Flickr album to do this - so that's the next challenge! Hello Colleen. When I first set up this blog, I had something like 'Loose Leaf' in mind but it was taken - hence the 'Loose and Leafy'. (It was a while back so I can't remember whether it was your blog which already had the name or another.) I'm happy with 'Loose and Leafy' and interested that we have similar names but our blogs are very different in content. Hello Fer. Thank you for wishing us some sunshine. Every so often, we get a tantalising glimpse so we know it's up there somewhere - above the clouds. Hello Weeping Sore. I'm glad you too like grasses. So often we undervalue the ordinary and what is (literally) under-foot. Dear Everyone, you might like to know that the next article for Loose and Leafy is posted - about the silhouettes of plants.